The content, and other matters related to the Site are protected under applicable copyrights, trademarks and other proprietary (including but not limited to intellectual property) rights. The copying, redistribution, use or publication of any such matters or any part of the Site, is strictly prohibited. Visitors are granted a non-exclusive, non-transferable, revocable license to access and use the Site solely for internal, personal, non-commercial purposes. Visitors may not copy, print, republish, display, distribute, transmit, sell, rent, lease, loan or otherwise make available in any form or by any means all or any portion of the Site or any Content and Materials retrieved. We do not provide services or sell products to minors, if you are below the age of 18, you may only use this website with the permission of your parents. We offer a 60 day refund policy. Please Note: Refunds can only be credited back to the account used to make the original purchase. Refunds are usually processed within 24 hours. The information provided on this site and in our guide is offered as-is, without warranty of any kind and the reader assumes all risks from using the information herein. We disclaim any and all liability from the information provided. You should always use your own judgement before acquiring any domain. Though we strive for accuracy, information on the Site may contain inadvertent technical inaccuracies or typographical errors. Information may be changed or updated without notice. We may also make improvements and/or changes in the products and/or the programs/offers described in this information at any time without notice. We make no representations whatsoever about any hyperlinked third-party sites which you may access through our Site or product. These 3rd party sites are not created or maintained by us. They are independent from our website, and we have no control over the content on those sites. Moreover, we do not endorse or accept any responsibility for the content, or the use, of such sites.While we have no information about the presence of such dangers on 3rd party sites, you should take the necessary precautions to protect yourself and your systems from viruses, worms, Trojan horses, and other items of a destructive nature. Please note, that we have an affiliate relationship with some of the vendors we promote and we get compensated should you purchase a product…but please also note that every single product listed in this guide is what is used for our own domaining purposes. 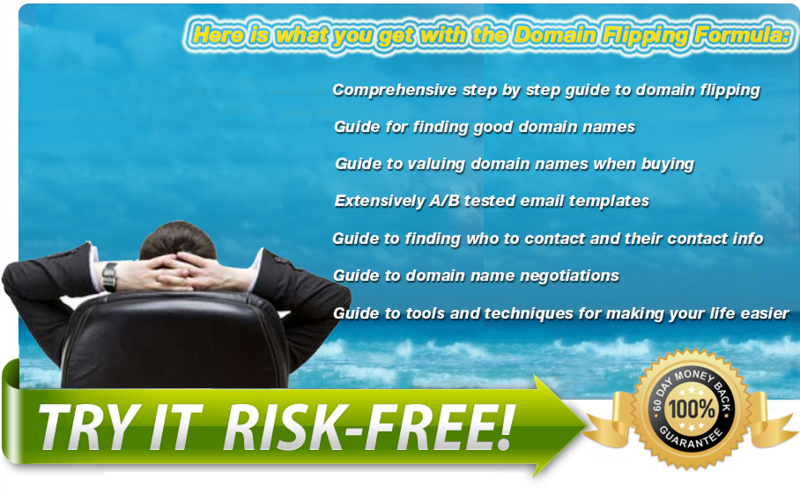 Also since nothing in life is certain, you agree that you will not participate in domain flipping unless you have the proper resources to do so. If you choose to participate in domaining, you do so of your own free will and accord, knowingly and voluntarily assuming all risks associated with such activities. Testimonials, case studies, and examples found on this website may not apply to everyone. By law, I am required to notify that there are no guarantees that you’ll earn any money by using the stuff found in the guide. Earning potential is dependent solely on the effort you put into the “program”. This is not a “get rich quick scheme”. Any claims about earnings are not typical. Your level of success is dependant on the time you devote as well as your technical and other skills. There are no guarantees about your success or income level. Please note that every effort has been made to accurately represent this product and the potenital…but you agree not to hold me responsible for any errors or ommissions found in the guide. Please note that this is an industry where you can write your own check, but there are no guarantees that you’ll earn any money in terms of earnings by using the techniques and ideas outlined in the guide. Also please note that there are always exceptions.